Successfully Added Oxidation Air Humidifier + Ionizer + Purifier to your Shopping Cart. Oxidation air humidifier with ionizing and deodorizing functions for keeping the air in your work area or small room in top shape. This 4-in-1 home or office functional unit (humidifier, ionizer, deodorizer, fragrance dispenser) is both compact and stylish. This unit humidifies the air keeping it moist and thus oxygenated to keep your energy level up. It also generates negative ions (anions) which bind to and neutralize airborne particles, making your air cleaner. 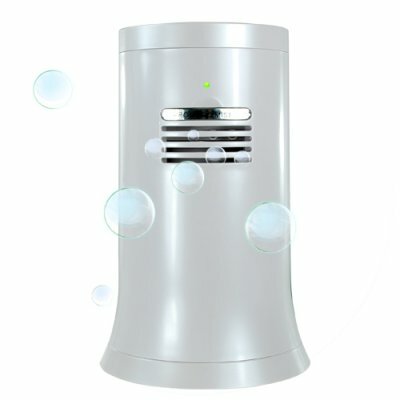 The internal carbon filter screen deodorize the environment by filtering out odors such as paint, smoke, or pet smells. In addition, you may place a few drops of your favorite perfume or cologne into the receptacle and have the whole room smelling great. This 4-in-1 Room Humidifier Ionizer Deodorizer and Fragrance Dispenser runs very quietly in the background, contributing to the pleasing ambiance it creates and the built-in microprocessor automatically adjusts the moisture content based on ambient temperature. With the whole world becoming increasingly health conscious, this is a great time to be offering high quality health products on your internet store or in your auctions. Take advantage of our low wholesale price to stock up on this hot new item. Offered exclusively by your favorite electronics wholesaler - Chinavasion. What is a humidifier? Who is it good for? A humidifier is a device which increases moisture in the surrounding area. It employs a fan and a filter immersed in water. The soaked filter facilitates evaporation, while the fan speeds up the process. Many people who have trouble breathing find positive results using a humidifier. In addition, people with dry skin can also benefit from it. The price of the CVFR-H09 is so low, is it refurbished? No, this is brand new. The price is so low because we are offering it to you direct from the factory, so you are not paying a store marked-up price.